As a component of the Society for Immunotherapy of Cancer's (SITC) regional, live Advances in Cancer Immunotherapy™ (ACI) programs, SITC is pleased to offer free online, introductory, CME-, CPE- and CNE-accredited programs via the society's online learning portal, SITC Cancer Immunotherapy connectED. These online activities provide an overview of basic immunology principles and the mechanisms and clinical applications of immunotherapy. If you missed the opportunity to attend an Advances in Cancer Immunotherapy™ event, you can still obtain the education and CME, CPE and/or CNE credits through many of the online programs listed here. Log in to the free ACI webinars to learn about new treatment approvals and emerging scientific data relating to clinical applications of cancer immunotherapy. Hosted by experts in the field, the webinars provide an opportunity to continue your learning from this ACI program and interact with faculty during a dedicated question-and-answer session. Complete these free, interactive online courses to deepen your understanding of cancer immunotherapy and learn about the most recent FDA approvals and the latest guidelines on how to treat immune-related adverse events. Five courses each featuring different disease states and one course addresses how to overcome practical barriers to implementation, which are critical for helping your staff to help patients obtain reimbursement for immunotherapy. Each course will take approximately 45 minutes to complete and is eligible for CME, CNE or CPE credits. In addition to a presentation (with audio), this online course includes links to the original trials, the latest FDA approvals, real-world case studies and questions to help deepen understanding and retention. There is also a printable chart outlining best practices for treating immune-related adverse effects and a link to the Cancer Immunotherapy Guidelines which can support decision-making. Ask questions as leading experts discuss the most recent immunotherapy treatment standards for specific disease states – stemming from SITC’s Cancer Immunotherapy Guidelines. 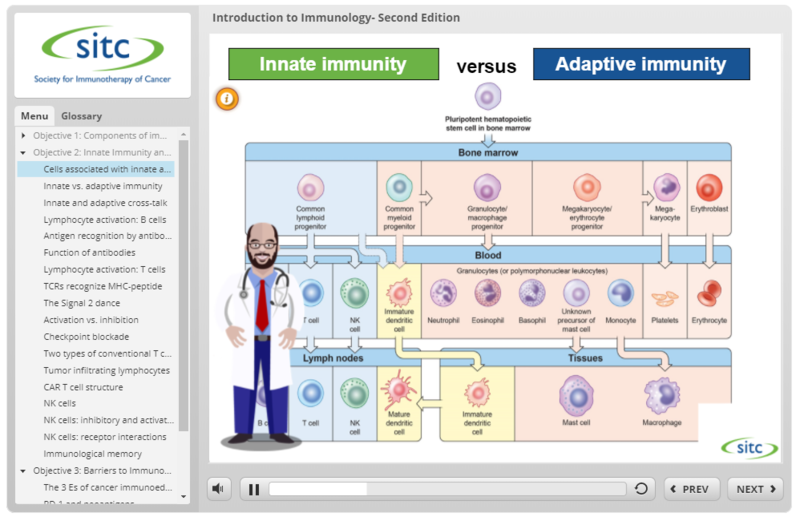 Introduction to Immunology – Second Edition is a free online pre-program course for the ACI regional education series. Participation by ACI program attendees is strongly recommended, however the class is available to anyone free of charge. This updated, interactive course provides foundational knowledge that is necessary for understanding cancer immunotherapy content that will be discussed at the in-person program. Click here to access this free course. The 2018–2019 ACI series is jointly provided by Postgraduate Institute for Medicine and the Society for Immunotherapy of Cancer. The 2018–2019 Advances in Cancer Immunotherapy™ educational series is supported, in part, by independent medical education grants from AbbVie Inc., Amgen Inc., AstraZeneca Pharmaceuticals LP, Bristol-Myers Squibb, Celgene Corporation, EMD Serono, Inc. and Pfizer Inc., Genentech, Incyte Corporation, Lilly USA, LLC, Merck & Co., Inc., Novartis Pharmaceuticals Corporation, Pfizer Inc. and Prometheus Laboratories Inc.